Alcohol and caffeine are by far the most widely consumed mind-altering drugs in the world today, so shouldn't we know a little more about the substances that give us that much-needed shot in the arm, or that take the edge off a rough day? 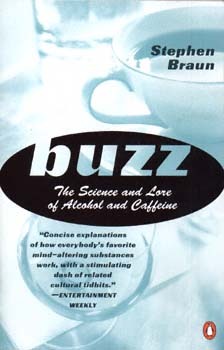 In this endlessly entertaining and colorful inquiry into the effects of coffee and alcohol, award-winning scientist Stephen Braun uses history and anecdote to explore the role of caffeine and creativity, booze and romance, and how these substances find their way into our blood stream, heart, and brain. David Letterman once said, "If it weren't for the coffee, I'd have no identifiable personality whatsoever," but few of us are aware of the subtle reactions these two substances provoke. With splashes of cultural lore and surprising facts --did you know that Bach composed a coffee cantata?-- Buzz illuminates, amuses, and often contradicts conventional wisdom. Whether you take it black, neat, with a twist, or a splash of milk, you'll enjoy the buzz you'll get from this eye-opening look at two substances that are immediately familiar, virtually irresistible, and deeply mysterious.